Could future technology take us beyond the edge of the observable universe? Essentially, since its inception, the cosmos has been growing at an ever increasing rate. Cosmologists estimate that the oldest photons that we can observe have traveled a distance of 45-47 billion light-years since the Big Bang. That means that our observable universe is some 93 billion light-years wide (give or take a few light-years). These 93 some-odd billion light-years contain all of the quarks, quasars, stars, planets, nebulae, black holes…and everything else that we could possibly observe; however, the observable universe only contains the light that has had time to reach us. A lot more universe exists beyond what we are able to observe. How can the universe be 93 billion light-years across if it is only 13.8 billion years old? Light hasn’t had enough time to travel that far…? Ultimately, understanding this facet of physics is the key to understanding what lies beyond the edge of the observable universe and whether we could ever get there. To break this down, according to special relativity, objects that are close together cannot move faster than the speed of light with respect to one another; however, there is no such law for objects that are extremely distant from one another when the space between them is, itself, expanding. In short, it’s not that objects are traveling faster than the speed of light, but that the space between objects is expanding, causing them to fly away from each other at amazing speeds. Ultimately, this means that we could only reach the edge of the observable universe if we develop a method of transport that allows us to either 1) Travel faster than the speed of light (something which most physicists think is impossible) 2) Transcend spacetime (by using wormholes or warp drive, which most physicists also think is impossible). According to the theory of cosmic inflation, the entire universe’s size is at least 10^23 times larger than the size of the observable universe. That’s a lot of universe that we are missing. So, what *exactly* are we missing? 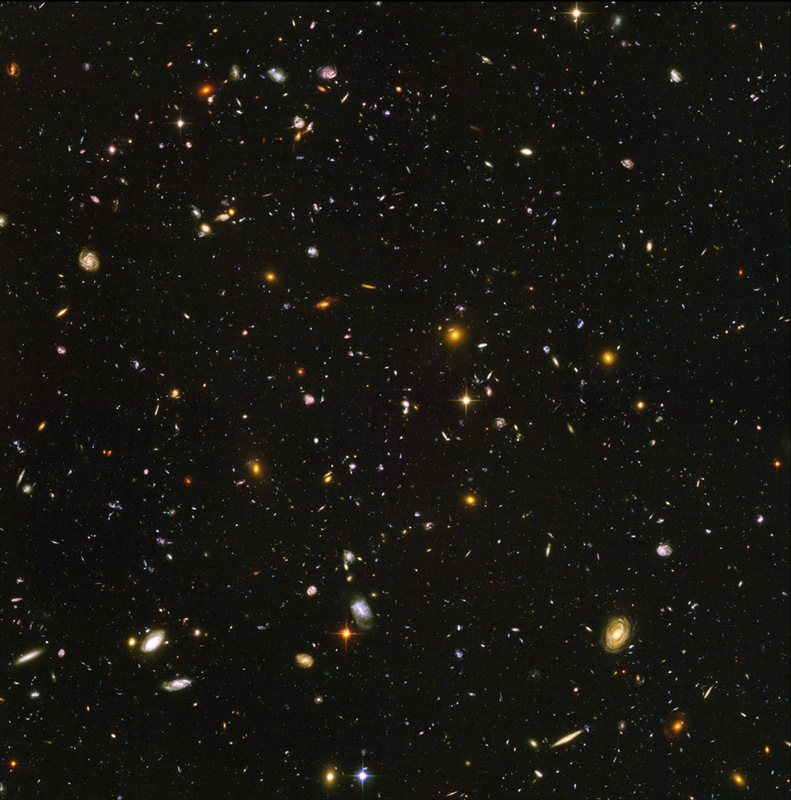 What is outside the observable universe? Unfortunately, since we can’t see it or measure it, we don’t know what lies beyond the bounds of the observable universe. However, we have several theories regarding what exists in the great unknown. Despite its strangeness, this first idea is one of the easiest to digest. Astronomers think space outside of the observable universe might be an infinite expanse of what we see in the cosmos around us, distributed pretty much the same as it is in the observable universe. This seems logical. After all, it doesn’t make sense that one section of the universe would be different than what we see around us. And honestly, who can envision a universe that has an end—a huge brick wall lurking at its edge? So, in some ways, infinity makes sense. But “infinity” means that, beyond the observable universe, you won’t just find more planets and stars and other forms of material…you will eventually find every possible thing. Every. Possible. Thing. That means that, if this holds true and we follow it to its logical conclusion, somewhere out there, there is another person who is identical to you in every possible way, and there is also a you who is only slightly different from you in every possible way (one is an inch shorter; one got hit by a bus 5 years ago and died; one has a missing finger etc.). In fact, this “other you” may be reading this article right now; the only difference is that they just picked their nose while you didn’t (or did you?). This notion seems inconceivable. But then, infinity is rather inconceivable. Another theory deals with something called “dark flow.” In 2008, astronomers discovered something very strange and unexpected—galactic clusters were all streaming in the same direction at immense speed, over two million miles per hour. One possible cause: Massive structures outside the observable universe exerting gravitational influence. As for the structures themselves, they could be literally anything: Amazingly huge accumulations of matter and energy (on scales we can hardly imagine) or even bizarre warps in space-time that are funneling gravitational forces from other universes. We simply don’t know what these massive objects could be. Notably, recent analyses have claimed to debunk the dark flow model, but this debunking is still being disputed. Another option involves a universe of universes. Some believe that the whole of our universe could exist in a small “bubble” in the midst of a vast array of other bubbles. 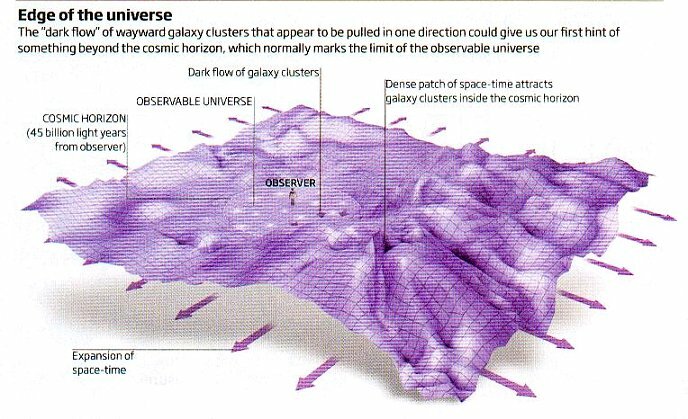 Theorists call this a “multiverse.” Interestingly, the idea asserts that these universes can come into contact with one another—gravity can flow between these parallel universes, and when they connect, a Big Bang like the one that created our universe may occur. If You’re in it For Gold, Clap Your Skates!